When President Thomas Jefferson asked Congress in January, 1803, to appropriate $2500 for an exploratory expedition into the Pacific Northwest, negotiations to purchase the Louisiana Territory had not yet begun. Not that Jefferson didn't have plans afoot: His long-term fascination with the oft-advanced theory of a water route from the Mississippi River to the Pacific Ocean became even stronger when he learned of Spain's secret ceding of Louisiana to France. Concerned about the aggressive Napoleon's motives, he dispatched James Monroe with instructions to purchase West Florida and New Orleans from the French. Fortunately for the United States, Monroe found Napoleon frustrated by a slave revolt in Haiti and the resumption of hostilities with Great Britain. The Emperor was only too happy to exchange all of France's holdings for much needed cash to finance his adventures in Europe. As word reached America of the sale, plans for the Northwest exploration were well underway, placing added significance on the venture. Jefferson put his personal secretary, Army Captain Meriwether Lewis, in charge of the expedition. Lewis chose his friend Captain William Clark as his partner and co-leader on the trek. On May 4, 1804, the two explorers and their party of mostly soldiers and frontiersmen set off up the Missouri River. Reaching an area near present day Bismarck, North Dakota by the end of October, they wintered with the Mandan Indians of the region. Apparently, they were made quite comfortable by the natives, as traces of the explorers' visit were visible in the physical characteristics of many upper Missouri Valley inhabitants for many years afterward. With the help of Sacagawea, the Shoshone Indian wife of the party's French interpreter, the expedition crossed the Rocky Mountains and explored the Snake and Columbia Rivers. They spent the winter of 1805 in a military outpost on the Pacific coast. In the spring of 1806 the party recrossed the Rockies, explored the Yellowstone, and after traversing more than 6,000 miles in two years and four months, arrived in St. Louis again on September 23. Their return was greeted with jubilation, as many had believed them long dead. Lewis and Clark were the first of the trailblazers of the 19th century, men who made it possible for other discoverers to push the limits of American expansion. The tale of their expedition is inextricably linked to the fortuitous purchase of the vast Louisiana Territory in 1803. And so it was one hundred years later when centennial celebrations were held for both events. The purchase of Louisiana was celebrated by a world's fair held in St. Louis in 1904, and the travels of Lewis and Clark were commemorated at a national fair in Portland, Oregon the following year. The appropriations bill for the Lewis and Clark centennial celebration passed Congress on April 13, 1904. 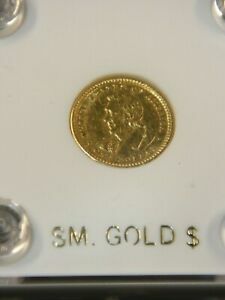 It also provided for the minting of a maximum of 250,000 gold dollars that would bear likenesses of the two explorers. The result was the first, and to-date only, two-headed U.S. coin. 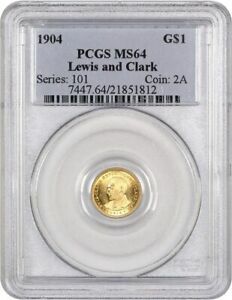 Designed and modeled by the Philadelphia Mint's Chief Engraver Charles Barber, the obverse bears a portrait of Lewis, and the reverse depicts Clark. Barber reportedly based the portraits on paintings of the two men done by Charles Wilson Peale. 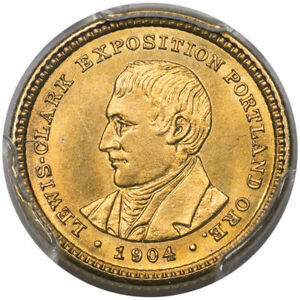 Statutory legends surround the portraits on both sides: LEWIS-CLARK EXPOSITION PORTLAND ORE. on the obverse, and UNITED STATES OF AMERICA and ONE DOLLAR on the reverse. The date appears below Lewis' portrait. All of the Lewis and Clark dollars were struck in the Philadelphia Mint. In September 1904, 25,000 pieces were produced bearing that year's date, a curious occurrence, as the coins remained in the Mint's vaults until the fair opened on June 1, 1905. 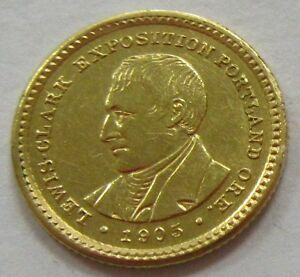 Just as with the Louisiana Purchase dollars, numismatic entrepreneur Farran Zerbe was again placed in charge of the distribution of the coins at the exposition. 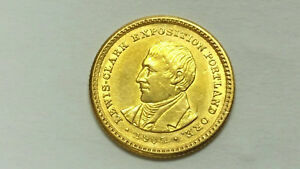 As he had done with the Louisiana dollars, Zerbe enthusiastically promoted the Lewis and Clark coins. 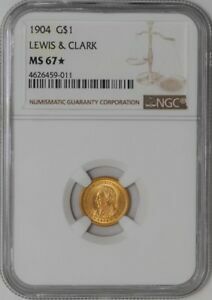 Learning a lesson from the sluggish sale of the Louisiana pieces that were issued at $3 each, the Lewis and Clark dollars sold for $2 per coin. Zerbe soon raised that to $2.50 by publishing the fiction that the 1904 issue was almost sold out. Few cared and even fewer bothered with the 1905 issue when it debuted at $2 per coin or $10 for 6 pieces. 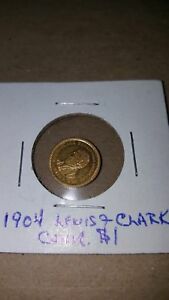 When the dust had settled and the exposition closed October 14, 1905, a total of 60,000 Lewis and Clark dollars had been struck: 25,028 of the 1904 coins and 35,041 dated 1905. The odd 28 and 41 pieces were reserved for assay. Of the 1904 issue 15,003 pieces were melted, leaving a net mintage of only 9,997. An even higher percentage of the 1905 dated coins - 25,000 - entered the melting pot, leaving a net figure of only 10,000 for that year. Very little is known about the fate of these diminutive coins. 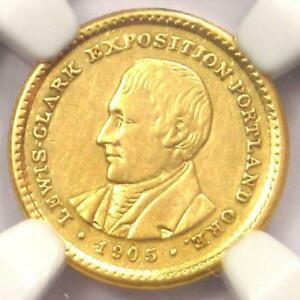 They were largely ignored by the numismatic press of the day and disdained by collectors who had seen the value of their Louisiana Purchase coins drop from the $3 issue price to $2 by the time the Portland exposition opened. 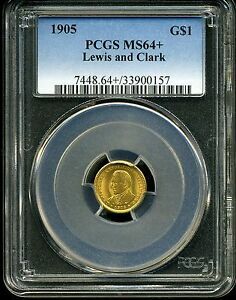 Their desire to complete the commemorative gold dollar series was obviously outweighed by an aversion to risk further losses on the Lewis and Clark coins. While 10,000 pieces of each date were distributed, surprisingly few choice uncirculated examples exist. Apparently, most of the coins were sold on the fair grounds to the non-collecting public who did little to preserve these souvenirs over the years. Many were also worked into jewelry as broaches and stickpins; some were even mounted in silver spoons. While interesting as ephemera from the exposition, such mounted pieces are of little numismatic value. 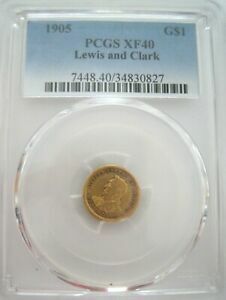 Most Lewis and Clark gold dollars are found in grades XF-AU, with occasional MS-60 through 63 specimens appearing. MS-64 pieces are very scarce, and gem MS-65 or higher examples are rarely encountered. 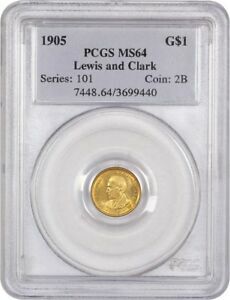 In grades above MS-62, the 1905 issue is decidedly rarer. Perhaps many of these unwanted second-year coins found their way into circulation during the Depression or suffered a more numismatically sacrilegious end in the melting pot after 1933. The portraits of the explorers are the first areas to show friction from handling or circulation. Typical surface luster covers the full spectrum, ranging from prooflike or semi-prooflike to frosty or dull satiny. Brilliant proofs exist: reportedly no more than four pieces of each year. Such coins display far greater design detail than ordinary business strikes. Because of the elusiveness of both years, counterfeits are known: some surfaced in the early 1960s, and although most were confiscated by the Secret Service, occasionally one is still seen today. These pieces are somewhat porous, with irregularly placed lettering and abnormally weak devices. 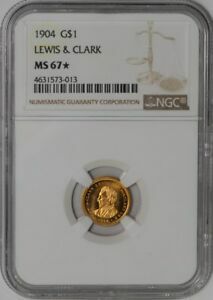 Ironically, the Lewis and Clark gold dollars, viewed as an afterthought to the Louisiana Purchase commemoratives of 1903 and slighted by collectors of that era, are highly regarded by the numismatic community of today. 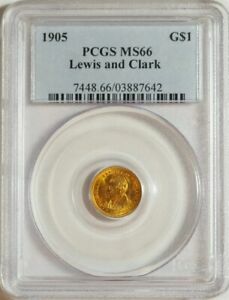 The poor reception afforded the coins at time of issue virtually guaranteed their rarity for future generations; in fact, they are the rarest gold dollars in the commemorative series. 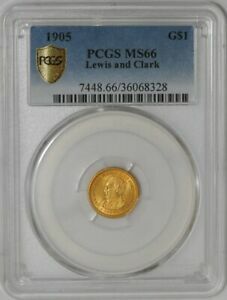 Despite Barber's mundane portraits and Zerbe's largely ineffectual attempts to market the coins, the Lewis and Clark commemorative gold dollars have finally gained the respect of collectors that they so well deserve.